Saturday Small Talk: Which of These Stories Surprises You LEAST? Happy Saturday! Today is the day I do NOTHING. I am very excited about this. Of course, Dog Hazel will still drag me outside for our daily walks, and I should probably buy milk, but otherwise NOTHING. And you can join me in my nothing by lazily talking about gossip stories. I’ll get us started! Which of these 3 stories do you find least surprising? 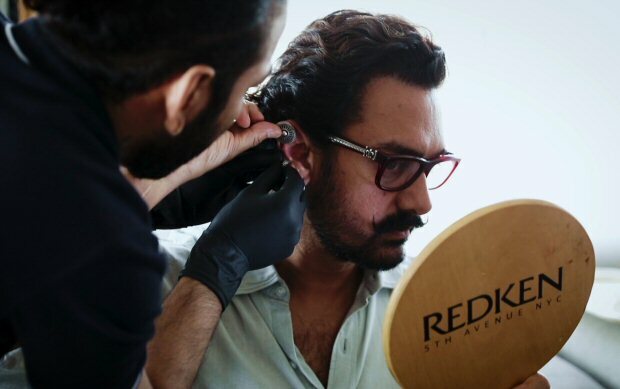 Aamir Khan, for his Thugs role, opted to actually get pierced all over the place instead of just using clip on fake jewelry like a normal person/actor. Who is surprised by this? Anyone? Anyone? Shahrukh has a major expensive movie coming out in about 6 weeks, and a religious organization (this time, some Sikh group objecting to the look of a knife in one sequence) has just filed an objection. Now, how many of you are shocked? And how many of you are pessimistically unsurprised? Despite Loveyatri flopping, Aayush Sharma has a second film already. Which is, like the first, produced by his brother-in-law Salman. Who would have thought this would happen!!!!! Is the answer, perhaps, EVERYBODY???? So, what story surprises you least? Aamir’s perfection, Shahrukh’s persecution, or Salman’s blind generosity? This entry was posted in Uncategorized and tagged Aamir Khan, Loveyatri, Salman Khan, Saturday Small Talk, Thugs of Hindostan, Zero by mredlich21. Bookmark the permalink. The least the complaint, then Aamir. However Salman giving another chance to Arpita’s husband…well, that’s surprising me…a bit. Happy for your leisure time…but you’re sure that you’ll do “nothing” (basically)??? Well “nothing” meaning writing a ton of blog posts and finishing my quilting square. That kind of “nothing”. But I won’t be running errands! Sadly, the threat to Shahrukh’s movie. I’ve only been following news about him for three years, and it’s already predictable old news to me. How long has this been going on? At least since My Name is Khan. The religious FIRs maybe a little bit longer, but Shahrukh in particular maybe 8-10 years I think. The more mustaches, wigs, piercings, hats, etc. involved in Aamir’s role prep, the worse his performance. I think he does that stuff as a crutch when he’s struggling with the character. I’m seeing Thugs later and dying of curiosity. Some folks I follow, including Melanie, say it’s not as bad as the reviews and that they enjoyed it so maybe it won’t be that bad? There are definitely bits I enjoyed, it’s not the worst movie I’ve ever seen. But it is hugely flawed in that irritating way where you can see the better movie trying to get out and being suffocated. Also, have you seen Sarfarosh yet? Aamir in slacks and button shirts the whole time, no props and no fancy hair or costumes. I haven’t because I struggled to find it with English subs. Though I just looked on YouTube and someone uploaded a version with English and Arabic subtitles. It’s a crappy print but at least now I have the option to watch the darned thing. This has been a crazy week full of good news (Blue wave!) and terrible news (Thousand Oaks shooting and wildfires) and I’m very appreciative to have Indian films to watch and talk about. I didn’t expect to plunge into all this so deeply but it’s been hugely gratifying. Thanks for commenting! I just started my scene by scene coverage, and as I look at it in depth in my head, what bothers me most are two things, first Aamir’s performance which just takes over the film. And second all kinds of little technical flaws which are very odd. The first could be a matter of taste, but the second is the sort of thing you may not consciously notice but it slowly wears you down. The ‘wearing down’ is the most mentioned as negativ….that one just wants the movie to be finished. There are some things that get irritating like Amitji’s Azaaaaadi (correct?) or the slow-motion. It feels a little like the filmmakers just wanted it to be over too. Comparing it with Main Hoon Na, for instance, where it feels like there were too many ideas to squeeze in, everyone was very excited about every moment. In this, it was all tired, like they knew they had to fill 2 and a half hours and just wanted to get it over with. Except Aamir (and maybe Fatima)…it seemed that Aamir really had a blast to play this character . I saw the preview of Thugs in the theater multiple times. Nothing about the trailer made me want to see it. Nothing anyone has said about it makes me want to see it. Even you dear Margaret who said many positive things did not make me want to see it. This Amir is a perfectionist; Amir is an intellectual nonsense makes me crazy. His best movies are no better than any one else’s and his worst ones are just as bad. I wasn’t extra excited for it, but then I wasn’t extra excited for Dangal either or any of Aamir’s hits. He’s just not to my taste. I can appreciate the quality of what he does when it is a good movie, but I never get like super super excited about them. Oh, except Talaash! That one I was excited for. What if Srk was in thugs instead? Probably still wouldn’t be extra excited for it. I haven’t been extra excited for a Shahrukh movie since Ra.One maybe? And then I ended up really loving JHMS, but the promos didn’t get me super super excited. Raid and A Gentleman are the two recent movies I can think of where the promos got me really ready for them. Which upcoming movies are you excited for? Hmm. I think that Anil-Sonam-Juhi-Rajkummar movie that has been advertised for ages and still doesn’t have a release date.